With MICO+ you can switch off machine parts that are no longer needed for current produc-tion processes. Like with assembly lines that do not operate 24 hours a day but only occasionally transport parts. A signal from the control is enough to put the module into a non-operating state. This saves energy and reduces the costs. With MICO+ you can reactivate the machine part quickly when it is needed again. MICO&apos;s 90% visual warning is a perfect tool for setting up machines and systems. If channels are near the limit, the LED starts blinking. Often the total current needed increases during operation. This happens because valves and motors wear out, for example. To solve this problem, the MICO+ 90% warning is additionally available as digital signal. The signal is transferred to the control, the control sets off the alarm - and counter-measures can be taken immediately. Two connection options are available per channel. You can connect twice as many loads as with the previous solutions. It&apos;s also easy to create features such as single channel monitor-ing: one wire to the load, the other wire to the control&apos;s input - there is no easier way! All devices feature a rotary switch to adjust the channel-specific maximum output current that has to be monitored. Depending on the MICO model, devices are available with cur-rent ranges from 1...4A, 1...6A and 4...10A. 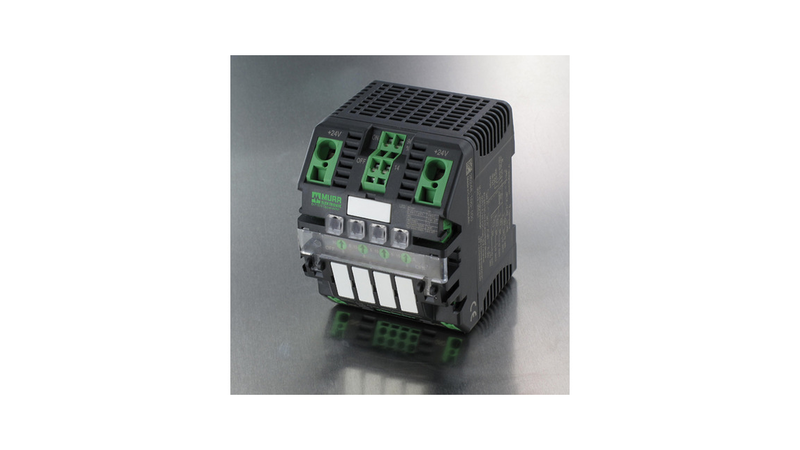 This reduces the number of different models to stock: one MICO model replaces four different circuit breakers. This considerably re-duces the inventory costs. There is also an attached lid that covers the rotary switches that adjust the current range. This ensures that the switches cannot be tampered with after setup.